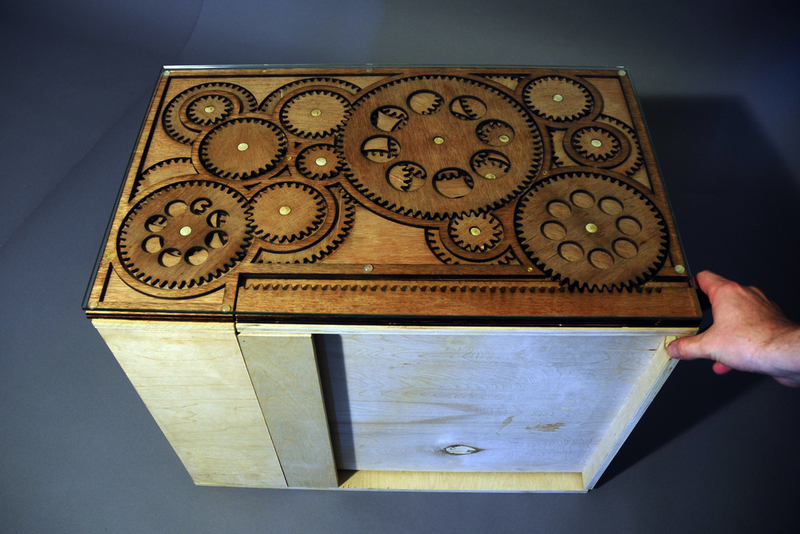 The surface of this small glass topped cabinet is covered in two layers of meshed plywood gears. The mechanism provides a satisfying resistance and a distinct wooden mechanical sound while the variable diameters of the gears creates varied speeds of rotation as the cabinet is slid open or closed. Together it creates an enriched tactile, auditory and visual experience to the otherwise mundane of the sliding cabinet. A two week orientation project envisioned as a tower partially submerged in a high latitude, coastal cliff region with highly variable tides. The 120’ tower has a 60’ glazed viewing room that at high tide is submerged 23 feet. Working with two concepts, Monolith and Barnacle, two masses of concrete, each carved with passages and then clad by an exterior panelling enjambed with ‘barnacle’ viewing portals growing within the gaps. Approaching from the higher coast, the occupant chooses to either descend below the waves, arriving at eye level with the sea upon entering the viewing chamber during high tide or climb spirally between the barnacled skin and the central mass of the tower to the top viewing platform. The catalyst and source of the project the neural networks in brains. The image to the right; stained hippocampal cells; began an investigation of the complexity of the network. In this image only 1 in 40 nerve cells are shown. Neuron cells exchange information through synapses, creating extremely complex networks, constantly creating and destroying connections.